River View is a short listed proposal for the final stage of the design competition organised by London Festival of Architecture, City of London Corporation, and Illuminating River Foundation. 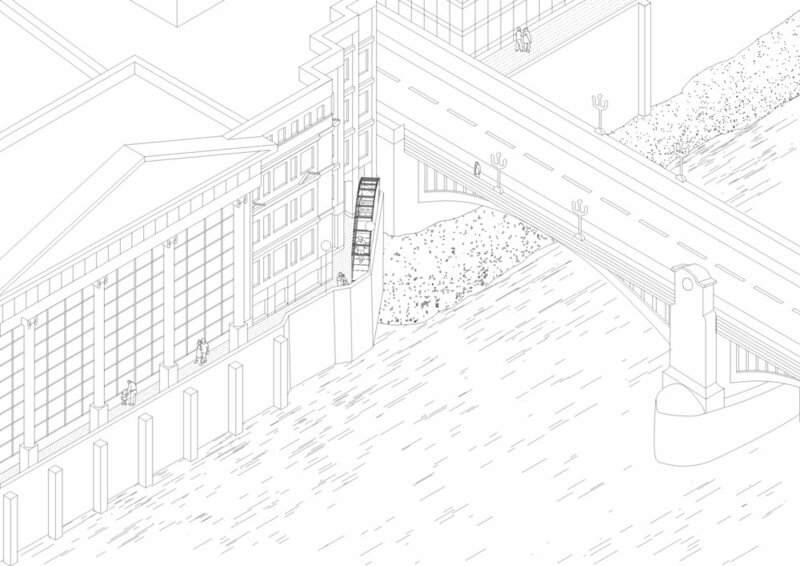 It is a temporary architectural installation, in order to encourage the greater public interaction with the North Bank of River Thames, between London Bridge and City of London School in front of Tate Modern during the summer 2019. We propose to install four timber structures on the four selected locations along the Thames path on the North bank, in order to highlight the qualities of each specific site and enhance the river bank as a whole civic space. The four timber structures use the same material and structural principles, which consists of using small sections of structural softwood and corbelling them to form catenary arches of various sizes to house different functions. 2 x 2” and 2 x 3” softwood timbers are the smallest dimensions of structural timber commonly available in the UK. By adopting the structural principle of traditional Japanese wooden bridges, the small size timbers are stacked to form a series of deep beams and connected with diagonal bracings to create an intricate spaceframe-like structure which can be viewed from below. Their simple and abstract form is easily recognisable as a set piece, though the four locations are relatively distant, and provide a continuity along the walkway. The structures are engineered by structural engineers Price & Myers in order to ensure they meet all the requirements for public load bearings. The largest one, next to London Bridge is called ‘The Stage’. 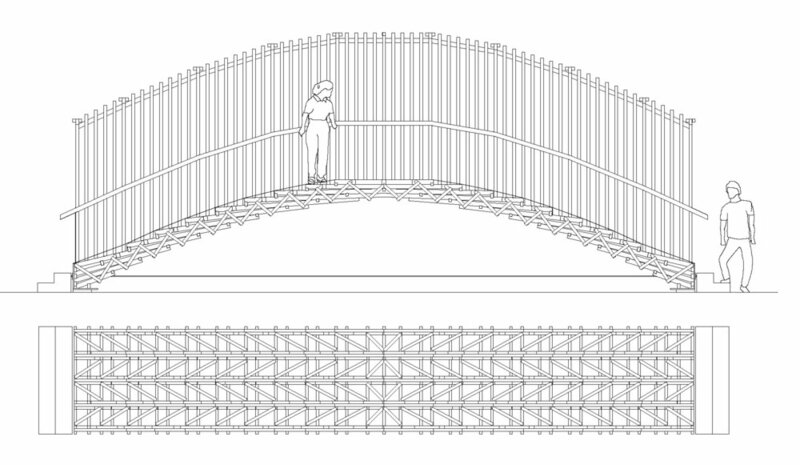 It will function as an arched path, 2.2m wide and 18m long. It elevates the viewing point 3m above the existing path at its highest point. The Bridge could be used as a stage, for special performances and events with public speakers. The arch provides a covered shelter below, where the raised deck acts as a second stage for performances, or simply a raised covered platform for meeting and gathering. The deck conceals the structural tie cables which keep the arch structure together. 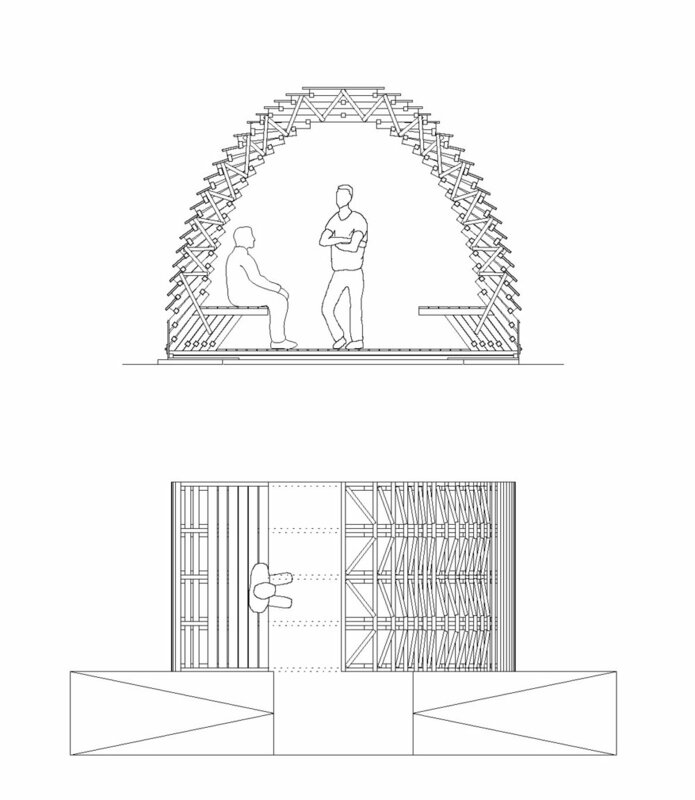 The second structure is called ‘The Cabin’, a small seating shelter for six people. The structure is placed against the embankment, so as not to obstruct the existing footpath and act as a window seat to view the river. The roof is covered with standard red and green coloured felt laminated onto marine plywood, as the rest of the structures, providing shelter in all weather. 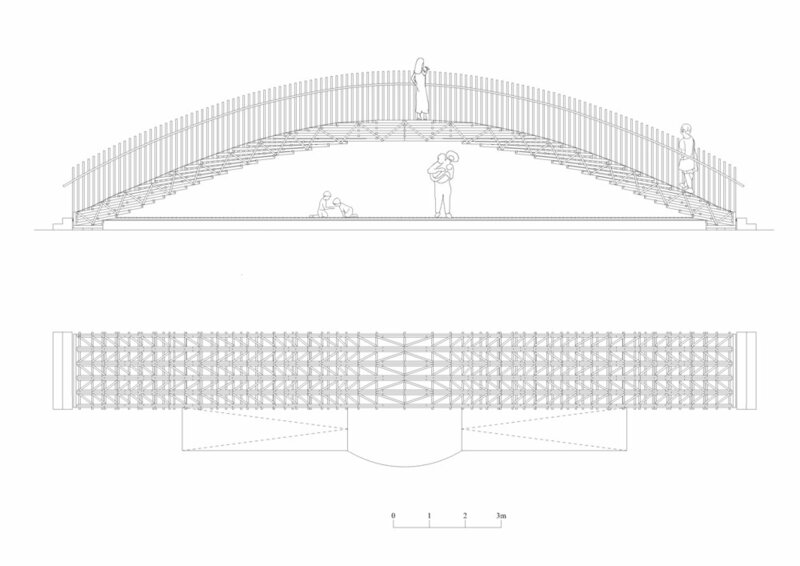 The third structure is called ‘The Tunnel’, a smaller version of ‘The Stage’, which is 1.2m wide and spans 10 m. The vertical slats create a tunnel-like, narrow space which responds to the surrounding alleyways and paths under the Southwark Bridge. The Tunnel is orientated in such a way that it frames the view towards the brick chimney of the Tate Modern. The slats obscure the view on both sides and focus on the distant view when you enter the Tunnel, and reveal the side views to the water when you walk through it. The fourth structure is called ‘The Bench’, and is a continuous seating element 0.8m wide and 50m long. It consists of five arches, providing various heights to sit, relax, or play. The timber is sustainably sourced in the UK, harvested and sawmilled in Scotland. As the City of London was once a city largely built of timber, it seems appropriate to use this renewable material extensively for our proposal. We are interested in the idea of legacy, by designing the structures in such a way that they could be re-used in different locations once the London Festival of Architecture 2019 is over.